TORONTO CATHOLIC WITNESS: Franciscan Friar declares: "why is climate change denial not yet a crime"? Franciscan Friar declares: "why is climate change denial not yet a crime"? Ramon "Ramoncito" Razon, a Franciscan Friar of Holy Name Province has declared that "climate change" should be a "crime". Does he want to jail "climate deniers"? Is it one year in jail, Ramoncito? Two, three, four or five? Just tell us how far you wish to go in terrorizing people who dare disagree with you. What do you intend to do with repeat offenders? Send them to a concentration camp? You will notice that Razon while being very noisy about "climate change" and other eccentric causes is silent about the holocaust, the real world war that is taking place: ABORTION. Interesting, very interesting. But this is not the first time that Razon has previously opined in a fascistic manner. Earlier this year (since scrubbed, though unsuccessfully), in an outburst of dissent regarding homosexuality, he waxed openly jabout the Catholic group, "Courage" being "sued". His fellow "Friar" Christian Seno then recommended they be "illegal","outlawed" and "denounced". Razon and Seno expressing their hatred for "Courage"
Razon is quite the fascist. One wonders how such hateful people can be permitted to become Franciscan Friars? One must conclude that the leadership of the Holy Name Province approve. 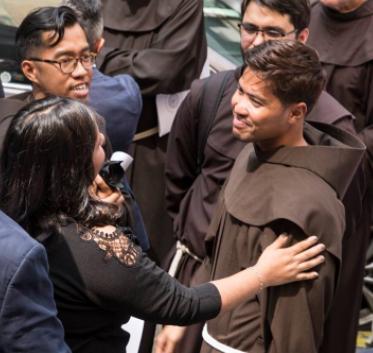 Unfortunately his dissent and hate-filled warped ideas, his grossly immature behaviour on social media did not stop the Franciscan Friars of the Holy Name Province from allowing Razon to take final vows as a Friar. Just how many other dissenting, pro-homosexual and fascistically inclined "Friars" are in this Province? The question must surely be - Why aren't sodomites within the entire priesthood not in prison, having first been excommunicated & expelled? These guys are totally off the rails and St. Francis would kick them out of the Order in a heartbeat....no, correct that, he would never have let them in to begin with. What shame! What travesty! Why is Ramoncita oh excuse me, RAMONCITO allowed to speak as part of a religious order as an individual? The guess is that you are correct, Barona. The "Franciscans" he belongs to ALLOW IT. Action or inaction speaks louder than words. The fact that this Franciscan can speak like this openly and not be disciplines indicates that his superiors endorse his views or don't care about the Faith. If the Church were not necessary for salvation, I would leave in a minute. As for almost all of the hierarchy, I wish nothing to do with them. Good work on showing who these fraudulent friars really are. Over my decade in ordained ministry, I've dealt with this province several times. While there are good, holy Franciscans out there this group seems to be plagued with dissent. The Shrine of St. Anthony in Boston, St. Patrick/St. Anthony church in Hartford, CT, and St Francis church 31st street in Manhattan are all run by the HNP friars. All three places are hotbeds (and I use that term purposefully) of the pro-gay agenda.